The Mitsubishi Evolution X driven by Indonesian Rally Champion Rifat Sungkar is preparing for this weekends New England Forest Rally. The Mitsubishi Evolution X driven by Indonesian Rally Champion Rifat Sungkar will be back this weekend for an exciting National Rally Championship event. Indonesian Rally Champion Rifat Sungkar will be trying to move up in the standings as he drives for the Fastron World Rally Team. Sungkar will be taking on the best drivers in the field starting tomorrow. The New England Forest Rally has some of the longest stages on the circuit with challenging logging roads for the drivers to navigate at high speeds. The race is a favorite among drivers due to the technical demands of the course. The spectators will be treated to exciting action close to stunning scenery and wildlife. The excitement builds when the drivers encounter winding creeks and one-lane bridges at neck-snapping speeds. Rifat Sungkar prepares his Mitsubishi Evolution X for the New England Forest Rally held in Newry, Maine on July 26-27th. The video below shows Sungkar getting his EVO X ready for the race. It was filmed at the Team O'Neil Rally School and produced by Driving Sports TV for the Fastron World Rally Team. Sungkar is ninth overall in the Rally America National Championship standings and has a chance of moving higher with only seven points separating him from fourth place. The task won’t be easy as four out of the five drivers ahead of the Indonesian Rally Champion will be competing at the New England Forest Rally. Both his father and grandfather were also race drivers and it’s in his blood to race. Rifat dedicated himself in the arena of national and international rally and has not disappointed his family. Sungkar is a star in Indonesia and in 2006 was awarded the "Star of Achievement" and given directly by the President, Mr. Susilo Bambang Yudhoyono. Rifat Sungkar has also excelled in the arena of motorsport drfiting. This weekends race should be exciting as the Mitsubishi Evolution X driven by Indonesian Rally Champion Rifat Sungkar takes on the world’s best drivers and tries to move up to fourth place. 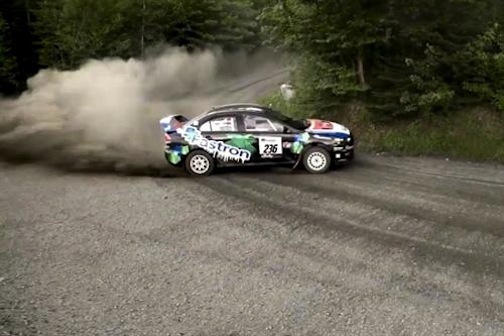 Watch New England Forest Rally 2013: FWRT Evo X Test video.